There are many types of RVs made to fit every sort of RVing lifestyle. One of the most popular forms of RV on the market, and what most people think of when they think RV, is the motorhome. Within motorhomes, there are subtypes such as Class A, B, C and even the B+. Let's explore Class A motorhomes including the unique advantages and disadvantages of this motorhome type so you can decide which is right for you. If someone was asked to sketch an RV, chances are they would draw something resembling a Class A motorhome. Class A is one of the most popular forms of RVing in the United States, so what makes a motorhome a Class A? The Class A motorhome looks like a public transit bus, long, rectangular and flat nosed. The idea that it seems like a bus is not far off at all as many Class A motorhomes are constructed on a bus chassis. Class As often have a large front window area for excellent vision on the road. Class A motorhomes may commonly be referred to as coaches or luxury coaches depending on the amenities. They may use regular gasoline, but many often use diesel fuel, large Class As that use diesel are known as diesel pushers. Class A is one of the most popular forms of RVing in the US, and there’s a reason for that. Class A motorhomes offer up many unique advantages that appeal to many people. Class A motorhomes are behemoths. Some models can be as long as 50 feet with the width of a large bus to boot. This available space is compounded because many come with slide outs that enlarge the motorhome. Class A motorhomes can sleep several people, up to a dozen on some models and offer other features such a large space and king size beds. Because they are so popular and large, there are no limits on the type of features you can get on your own. Popular features include entertainment systems, kitchens with plenty of storage or full bathrooms. If you want tons of features, look to the Class A motorhome. The Class A doesn’t come without its unique drawbacks as well. There are a few disadvantages when it comes to the Class A. You don’t get these features and space without paying for it. Class A motorhomes are the most expensive on the market with pushing into six figures on price, and that’s up front. Class A motorhomes are often gas guzzlers as well, with some models only achieving single digit miles per gallon. So, you’ll be dropping some big money up front, and every time you hit the pump. Size isn’t always helpful in the world of RVing. It takes a practiced hand to navigate the highways and trail roads in a Class A motorhome. Finding accommodations to park can be a nuisance as well as backing up. If you’re uncomfortable in large vehicles you may want to train up to the Class A. Unless you’re bringing a secondary car with you camping, you can get stuck at your campsite. No one wants to drive the big coach down to the convenience store for a gallon of milk. Class A motorhomes are among the most popular, so expect variety in selection. Though there are several types of Class to choose from there all unique features to the Class A. High-End and High-Price: Class As can cost several hundreds of thousands of dollars and up to a few million dollars. Class A is the most luxurious and spacious of the motorhomes, so be aware. Size: Class A is the largest type of motorhome, and they come in several sizes. Diesel or Gas: Most Class A motorhomes run on diesel fuel, but smaller models might run on gas. Full-Sized Everything: Space isn’t as scarce on a Class A motorhome as it is on other motorhomes so that you can expect full-sized kitchens, showers, sleeping quarters, dining quarters, and more. Most-Customizable: Class A motorhomes are the most customizable of three types. When there’s more room - they’re more options. Sleeps 4 to 12: If you need a lot of room for a lot of people, you need a Class A motorhome. Let’s review three great current Class A models, so you know what to shop for. Monaco is always found at the top of consumer rankings due to their solid, luxurious Class A coaches. The Signature stands out for both its value and its amenities and features. There are several floor plans available on the Signature but expect a King-sized mattress, two separate toilets, large standup shower, full kitchen, three HD TVs - even a washer and dryer. All these amenities in hand-crafted wood and high-end materials make the Signature one of the top-selling Class As on the market and a good fit for several types of RV needs. Tiffin is another name that’s synonymous with Class A motorhomes, and the Open Road Allegro is one of their most popular models. A Ford V10 moves you and your family efficiently down the road while two AC units keep the ride cool. You can outfit your Allegro with king mattresses, flat-screen TVs, and even a full-sized residential refrigerator. The living area comes with two slide-outs to expand your space as you and the whole family saddle on the couch for a movie. The Allegro comes with proprietary technology like quiet climate control technology, multiplex wiring, and artisan-crafted custom cabinetry. Flair is a great example of a small Class A. Class As are the largest of motorhomes, but they don’t have to be sixty feet to give you a good time. Though the Flair is ‘smaller’ is still comes with great amenities like a king bed, TVs throughout, full-sized dining, kitchen, living space, and bathroom. Fleetwood utilizes unique construction methods and ‘intuitive details’ as the company calls it (like Rev Control Suspension) to create a reliable motorhome that will show you and your family a great time for several years. The Flair can navigate streets that larger Class As have to detour around. 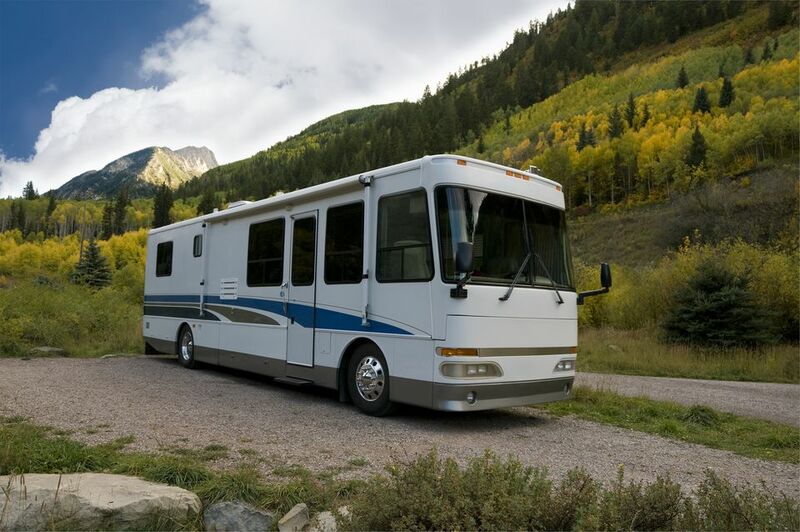 The Class A motorhome is full of several unique advantages and disadvantages. Talk to a local dealer, fellow RVers or hop on RVing forums to get a better feel if the Class A motorhome is the right ride for you.